NovaBone's bone graft substitutes build strong bone fast through an engineered cellular response that accelerates the regeneration of bone. NovaBone Products was established in 2002 with a focus on developing synthetic bone graft substitutes based on advancements in biomedical engineering that would meet the specialized needs of orthopedic and dental surgeons worldwide. NovaBone has developed numerous formulations and delivery systems of its patented, bioactive technology platform that accelerates bone growth. NovaBone core technology is presented to the clinician community in different formats: Putty, Particulate and Morsels. NovaBone’s graft products have been used in several orthopedic, dental & craniofacial indications for over a decade in over a million clinical applications with unparalleled success. The company is headquartered in Jacksonville, FL with manufacturing & R&D facilities in Alachua, FL & Gainesville, FL respectively. NovaBone products are available world-wide through an extensive distributor network. The company also has sales and marketing offices in Shanghai, China & Bangalore, India. Unlike other synthetic bone substitutes that are bioinert, the active ingredient in NovaBone’s offerings belong to the class of bioactive regenerative materials. It is an active process that not only provides as an osteoconductive scaffold but also chemically interacts with the surrounding tissues resulting in proliferation and differentiation of new bone cells at the site. This phenomenon achieves faster bone regeneration than exhibited by osteoconduction alone, while also simultaneously increasing the resorption rate of the implanted graft material. Unique properties of the product formulation gave rise to the need to scientifically define this bone-forming process. In 2005, the FDA authorized the term “Osteostimulation,” as a way to describe this technology that can signal genetic pathways to accelerate natural regeneration of bone. Numerous publications demonstrate this active mechanism. Various grafting materials have been successfully utilized to increase bone volume before or during implant placement. A common challenge of augmentation protocols, however, especially when bone grafting with a granules or even most putty systems, is the possibility of migration and/or inadequate space maintenance, which ultimately decreases the possibilities of achieving the desired bone volume. Novabone is Calcium-Phosphosilicate bone putty that results in an osteostimulation regeneration process that is FDA approved. It has excellent adaptability characteristics and lack of migration. It can be dispensed in a unique cartridge system in a variety of sizes. This presentation will demonstrate the utilization of Novabone in several different applications to include ridge preservation and sinus grafting and immediate implant placement. Immediate implant placement has proved to be a highly successful treatment modality, with a high rate of success and patient acceptance. However, not every site has the ideal bone morphology suitable for immediate implant placement. This necessitates the use of guided bone regeneration techniques either simultaneously or prior to implant placement. Presented here is a case report wherein guided bone regeneration was done simultaneously at the time of immediate implant placement to achieve a desirable outcome. NovaBone Dental Putty is a unique premixed moldable bone graft putty. It is completely synthetic and demonstrates unsurpassed handling characteristics. 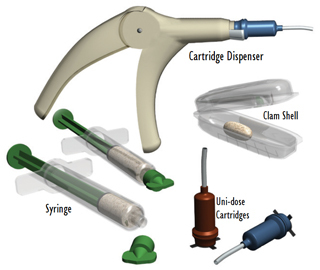 ‘Tray’ (Shell), Syringe & Cartridge delivery systems are available giving the clinician the flexibility for placement in various indications. While the ‘Tray’ format is ideal for molding and use with hand instruments, the sryinge and cartridge systems, being prefilled, eliminate the need for handling thus simplifying the delivery of the graft into the defect site. The putty cartridge delivery system is unique and an industry first. Putty is available in single and multipacks with 0.5cc – 2.0cc volumes.